The Wellesley College Student-Athlete Advisory Committee (SAAC) welcomed alumnae student-athletes to campus last Friday for a networking dinner. 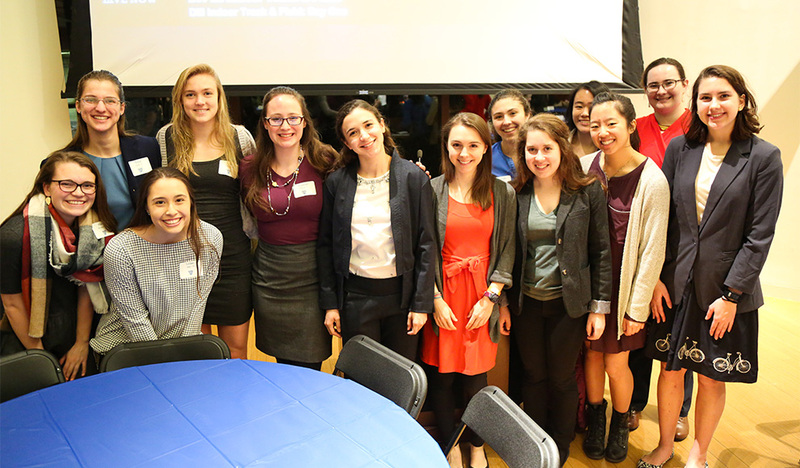 The event provided an opportunity for current student-athletes to engage with former student-athletes about their time at Wellesley and learn about their experiences following graduation. Olivia Duggan '17 said the dinner provided student-athletes with a wonderful opportunity to "meet people with whom they shared such an intense and formative college experience." She added, "the one-on-one conversations with former student athletes who worked within our fields of interests allowed us to see how being a college athlete prepares one for life after Wellesley." Bridget Belgiovine, director of athletics and chair of the physical education recreation and athletics (PERA) department, said, "The strength of our Wellesley Network was truly on display as so many alumnae athletes from a diversity of sports returned for this Friday evening event." The dinner was initiated by students and every stage in planning the dinner was student led. Belgiovine said, "The leadership and commitment of our current student-athletes to plan and execute this event is indicative of the impact of a Wellesley education and the lifelong bonds and connections that are so valuable. The event was a powerful opportunity for our current athletes to connect, share stories and learn from those who 'lived in their shoes.'" The 35 alumnae in attendance, who were on hand to offer networking and mentorship opportunities, represented the fields of athletics, business, computer science, education, government, health, journalism and media, law, nonprofits and fundraising, policy, research and technology. Over 100 current student-athletes attended. Duggan called the attendance "a testament to how strong the Wellesley network truly is."